Hammock camping and backpacking is becoming more popular than ever as people of all types realize how much easier and more comfortable this shelter is over traditional tents. There are unfortunately a lot of cheaply made, uncomfortable hammocks on the market so it’s important to choose wisely. Shopping for a hammock isn’t much different than a tent. You will want to find something that is comfortable, easy to set up and won’t take up too much space in your backpack. It should be appropriate for what you have budgeted for the piece of gear and it should be durable enough that it doesn’t up being a waste of money. Bottom Line Up Front: My favorite go-to backpacking hammock is the Eno DoubleNest available here. To read further, here are 3 of the best hammocks on the market for backpacking. One of the most highly rated camping/backpacking hammocks on the market is Warbonnet’s Blackbird. Warbonnet Outdoors has a few different hammock selections but the Blackbird quickly became a favorite among all outdoor enthusiasts, both those new to hammocks and others who had already made the switch from tents years ago. The Blackbird is a super lightweight hammock available in two colors and 4 fabric options, in single and double layers. If you are a larger/taller person you may be better off with the Blackbird XLC, which is an equally impressive hammock. Also, if you like to use an additional sleeping pad with your hammock setup, the double layer can come in handy since you can tuck it between the layers which prevents it from sliding around. The 30/70D nylon is treated with a DWR or Durable Water Repellency finish and the hammocks are roughly 120″ x 63″. This model is a mosquito hammock so you can rest easy with bugs buzzing around your face. The full length zipper allows you to unzip the mosquito netting and roll it out of the way if you want. The hammock has a decent sized footbox and there is also a built in storage shelf for small items. Depending on which options you go with, you can expect to pay anywhere from $170 to $195 for the Warbonnet Blackbird (check this listing for the latest live prices). This hammock is popular for good reason. It’s reliable, extremely comfortable and super compact. It is perfect for backpackers, especially those who are into light to UL backpacking. Similarly to Warbonnet, Hennessy is another brand that focuses on the art of creating camping and backpacking hammocks. Their most popular model is the Expedition Asym Zip. If you find that the Warbonnet Blackbird model you were interested in is too much money or you want a hammock that is more durable in terms of fabric, the Expedition would be a great choice. The Expedition Asym Zip is easy to get in and out of thanks to the dual-zippered side entrance. This hammock also has a few others features like mesh storage pockets attached to the ridgeline and special webbing straps to protect trees (setup involves webbing and buckles). The mesh netting is perfect for keeping bugs at bay and the include rainfly makes this model ready to go right out of the bag. Overall the tent looks great and is very comfortable to sleep in. Hennessy really made this model to last, thanks to the extra-strong zippers and the thick denier nylon used in it’s construction. Henessy does offer a special customization feature which gives options for longer webbing straps, padding, insulation and different rainfly’s. The only downside is that this hammock is only available in one size which can be an issue for those who weigh over 250lbs or are over 6′ tall. For the average person on a budget, the Expedition Asym Zip would be an excellent addition to your backpack. If you have a tight budget to adhere to or are a dedicated tent camper who only wants a hammock for occasional backpacking use, the Eagles Nest Outfitter’s (ENO’s) DoubleNest hammock. This double hammock is big, strong, versatile and won’t break the bank. Typically two person capacity hammocks are best saved for pure recreational use since they tend to be very heavy or can’t compress down enough to be stored compactly in a backpack. The ENO DoubleNest is an exception. In many ways, it’s the ultimate backpack hammock. 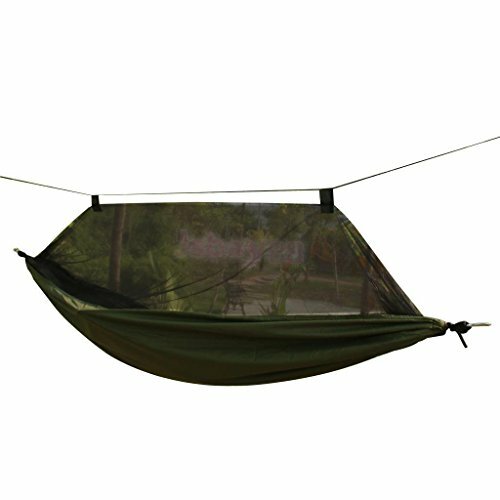 A major advantage of this hammock is the numerous colors options, the sheer size, the weight and how inexpensive it is. Depending on the color choice and retailer, you can expect to pay anywhere from about $50 to $70 (check this listing for the latest live prices). 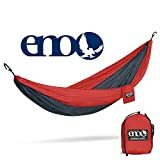 This is a great deal for an introduction to hammock and when it’s not in your backpack you can hang it up in the backyard. There are a few downsides to this model. First off, this hammock is strong but the fabric isn’t as thick and durable as the Blackbird or the Expedition Asym. So while this hammock may be able to hold a significant amount of weight, it can be prone to punctures. Also, despite the 400lb limit, most other users recommend not going over 350lbs just to be safe. Another downside is that this hammock is just a hammock- it doesn’t come with a suspension system or a rainfly so you will need to purchase these items separately. This will increase the price of going this route however so keep this in mind. 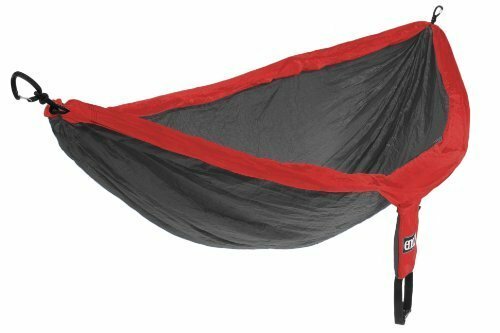 Despite the downsides, this is a great quality hammock that is extremely popular amongst campers and backpackers who want something spacious and inexpensive but will remain comfortable and safe throughout years of use. If the Blackbird and the Expedition Asym are just too expensive or you just don’t need a “serious” hammock, the DoubleNest will leave you a happy customer. There are a lot of reasons to choose a hammock over a tent but you won’t be able to really experience the difference until you try it yourself. If you are interested in making the change, choosing any of these 3 will ensure your experience is a great one.